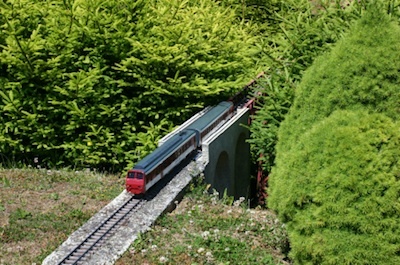 Garden trains are a wonderful way to enjoy the hobby of model railroading. One of the main advantages of running garden trains in your back yard is that it brings your railroad into full view for all of your family and guests to see without it being hidden away in an attic or basement. Another advantage is that your whole family can be involved in helping you build and operate it. Some members will like doing the construction. Others will like placing and nurturing the plants. Everyone can help with the cleaning and maintenance; and more importantly, everyone can enjoy it together. The first thing to do is to determine the best location on your property to build your garden train layout. One of the best places is near your back patio where the railroad is easily visible and can be a topic of conversation. Or it could be located in a central courtyard that is present in many homes these days. It can greatly enhance your rock garden or your terrace as well. You could have track going around the pool or lining the front of your flowerbeds. Also, a garden railroad would be a great addition to a greenhouse. Next you will want to be sure the drainage is adequate in the location you have chosen. Before installing the railroad, inspect the area during or after a rainstorm and see where the water goes. If there is a lot of pooling in the middle of where you want to put your layout, you may need to put in some drainage tile or pipe to carry the water away from the area to a lower level. Other options would be to elevate your railroad using salt-treated wood or to build up the gravel roadbed fairly high to keep your tracks from flooding when it rains. Another consideration might be to make a small water pond in the middle of your railroad or nearby so that water will naturally gravitate to and accumulate in the pond away from your track.You may want to use a combination of any or all of the above. The important thing is that you don’t want to have standing water or mud on your tracks if you can help it. For a simple oval or figure 8, draw your garden train track plan on a sheet of paper first. You may want to include where you want to put structures like train stations or freight houses and where you might like to put bridges or tunnels. Also include which plants you want to put in and where. If you want a more complicated plan with switches and sidings, draw those into your plan as well. You can pour a 3-4 inch pad of cement as a roadbed or use salt-treated wood. For rigid roadbeds like these, make sure to consider expansion joints to allow for expansion in the heat of the summer and contraction in the winter. The other option would be to use a so-called free-floating roadbed using crushed gravel on top of flat ground on which you can lay your track and then use finer gravel to fill in between the ties to hold your track in place. I would use the latter method if there’s a good chance you may want to change your track plan later. You may want to use a ground covering tarp that will keep weeds from poking through. These can be purchased in rolls from your home or building store. An inexpensive way to do this is to just lay newspaper down. This will work just as well to prevent weeds, but they will have to be replaced more often. Put these weed guards down on the ground wherever you don’t have the tracks and roadbed. Then cover them over with a thick 3-4 inch layer of high quality mulch, being careful to keep the mulch from getting on the tracks or on the gravel roadbed. Now it’s time to select whatever plants you want to use and figure out where to put them. You should mostly select small low growing plants. Make sure that when they grow, the roots or plants won’t interfere with the track or the garden trains. Try to select ones that will be relatively low maintenance. Your favorite garden center should be able to help you pick out the right ones. Your trains should be kept indoors except when you are using them. The track of course can be left outside. Make sure you use a high quality of track that will be durable outside in harsh weather. Some tracks that come with starter sets are best replaced by better track more suited for outdoor use. Locomotives containing batteries and electrical motors will not do well if left outside. Some people cover them to keep the rain and wind off, but the best thing is to bring them inside where the humidity can’t get to them. Some folks like to use a pet door and put track through it so that when it’s time to come in for the evening, the train can be run inside through the pet door! You can use O scale equipment outdoors these days since there are now manufacturers like Atlas and others that have produced O scale track that is relatively weatherproof. The electrically operated O scale locomotives may require more meticulous attention with respect to making sure they stay out of bad weather and keeping them clean and lubricated. Most of the G scale structures you buy for outdoor use are fairly durable in harsh weather and can be left outside unless you live in an area where the winters are particularly severe, in which case freezing rain and ice could crack some structures.You should make sure your structures are anchored well enough to withstand wind and rain. You don’t want to have to reposition everything after every storm. If you have a backyard and if you love model railroading or just love trains in general, this is for you. It will get you outdoors and off the sofa. You will constantly be tinkering with it wanting to change this or that, add more plants, build tunnels, etc., etc. The quality and number of locomotives and rolling stock that are available now for this hobby are ever expanding. Many of them can blow smoke and have lights, bells and whistles that you can operate from a handheld device. Also, the garden trains in G scale are very impressive. It’s been said that if they were any bigger, you would have to buy a ticket! The best resource on the web with tons of free information about building and maintaining a garden railroad is at Family Garden Trains authored by Paul D. Race. A beautiful and very inspiring example of a garden railroad is found in the New York City Botanical Gardens. If you happen to be in the area around the Holidays, don't miss it! From "Garden Trains" to "HomePage"